Previous versions of VZAccess Manager must be uninstalled before proceeding. Refer to Uninstalling/Reinstalling VZAccess Manager for assistance. The Windows 8.1 version of VZAccess manager will operate properly on Windows 10 after applying the work around outlined below. Close any open apps, launch an Internet browser then navigate to http://vzam.net. From the left menu, click Consumer Downloads. From the operating system dropdown menu, select Windows 8.1 then follow the on-screen instructions to select the appropriate software for your hardware then tap Continue. VZAccess Manager 7.10.0.1 (2823b) for Windows 8.1 is compatible with Windows 10. From Download VZAccess Manager, click Download Now. From Verizon Mobile Broadband Driver install, click Next. From the wireless network driver selection, click LAN Adapter then click Next. Click Install then click Finish (from the Install Shield Wizard Completed prompt). From the VZAccess manager install, click Next. Both, the Smith Micro Software and the Verizon Wi-Fi License Agreements must be selected. Click Install then from the Install Shield Wizard Completed prompt click Finish. Launch the VZAccess manager and click Connect. If necessary, refer to Establishing/Terminating an Internet Connection. Ensure the current version of VZAccess manager for windows 8.1 is installed. 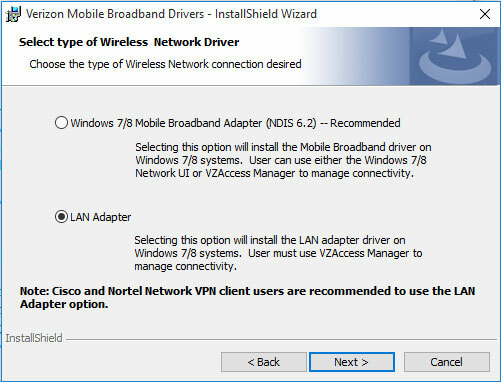 VZAccess Manager 7.10.0.1 (2822b) for Windows 8.1 is compatible with Windows 10. Refer to Uninstalling/Reinstalling VZAccess Manager for assistance. From the left menu, click Connect. From the Device operating mode dropdown select Lan Adapter. 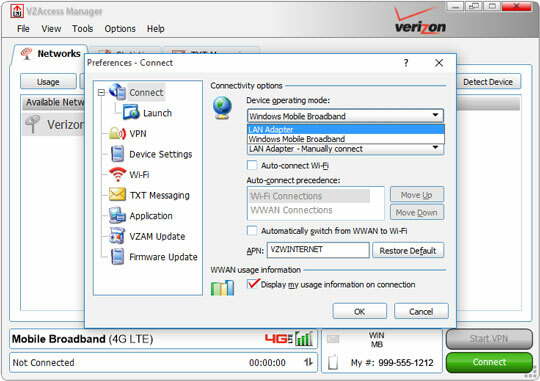 After the operating mode configuration prompt, click OK to restart VZAccess manager. VZAccess Manager 7.10.0.1 (2821c) for Windows 8.1 is compatible with Windows 10. To obtain the correct version refer to Download and Install VZAccess® Manager for assistance.